The OAHS has started to develop “Family Files” which will become the core for our genealogical resources. The file may include obituaries, photographs, newspaper clippings, family sheets, pedigree charts, census records, or other documents. We welcome material from area residents or people with family ties to Oregon wherever they may be. Also, the biographical sketches on our website are a source of genealogical information. We need your help! The Oregon Area Historical Society is attempting to have a complete collection of Oregon High School Yearbooks. We still have many gaps. Does anyone out there have copies of yearbooks they are willing do donate to the OAHS? In 2008-2009, the OAHS began a project to enlarge historic photographs and make them available to the community. A display took place in the Sue Ames Room at the Oregon Public Library for several months. The photos are now being distributed to local businesses and establishments. A PowerPoint presentation of the display is now on the OAHS website. Pioneer Clothes and Wax Museum Costumes. Each year the OAHS “Loaning Closet” outfits approximately 350-400 students from the Oregon Schools. Schools include Brooklyn Elementary, Netherwood Knoll Elementary, Prairie View Elementary, and Rome Corners Intermediate School. 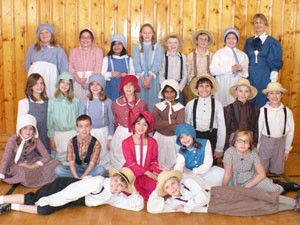 Pioneer clothing is provided to 4th graders for their “pioneer days” projects and events. We also help with historic costumes for 5th graders when they do their “Wax Museum” presentations. View the 20th Year of Pioneer Days video here. In recognition of Wisconsin’s sesquicentennial in 1998, the Oregon Area Historical Society undertook a project to identify sites of rural school houses in the Oregon School District. Signs were erected on the sites identifying the school. Tours of the school sites were conducted. A book on the one-room country schools is available for purchase at the Museum. 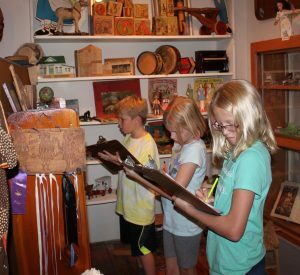 Young people are invited to participate in the Summer Scavenger Hunt at the OAHS museum. Locate items and answer some questions and you will get a prize. Entries go into the “treasure hunt” box for a drawing at the end of the month for a gift certificate. Our website is rapidly growing and expanding in content. You will find early histories of Oregon, a PowerPoint presentation with historical photos, biographical sketches of early settlers (with a wealth of genealogical information), maps, military rosters, and photographs. The OAHS card parties are held at the Oregon Senior Center, and provide another means of fund raising. The OAHS sponsors the card parties in June, July, August and September. A light lunch prepared and donated by members is served following the card party. Pies, cakes, and bars served with ice cream and soft drinks are available at the Oregon Area Historical Society Ice Cream Social sponsored annually during a June Oregon Community Band Concert. The OAHS is a frequent participant in the parade at the Oregon Summerfest, which takes place in late June of each year. The OAHS has received many awards for their entries in the annual parade. Many diverse volunteer opportunities are available, many of which can be done at home: Sewing, transcribing material for the website, cleaning, giving tours, staffing museum for Tuesday and Saturday openings, helping with displays. We also welcome donations of food or cash for special events.